You are currently browsing the archives for the “World Horror Convention” tag. I’ve been a Stephen Volk fan ever since I caught the movie Gothic at a midnight run back in 1987. 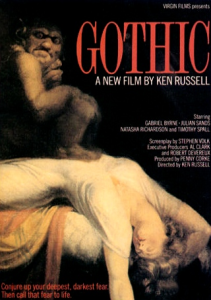 Directed by Ken Russell, the same over-the-top director responsible for such classics as Altered States and The Devils, Gothic presents Stephen Volk’s reimagining of events that led to the writing of Mary Shelley’s Frankenstein. 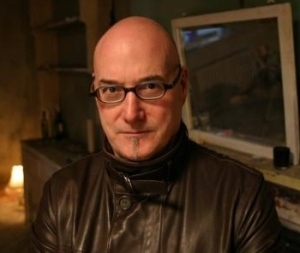 Among his other film credits are Ghostwatch, which made broadcast history by smashing television’s fourth-wall back in 1992; and The Awakening (2011), which may be the best ghost story ever put on film. Volk has also authored some of the best novellas and short stories currently available in the genre, and over the years I’ve had the privilege of appearing with him in the anthologies Gaslight Grotesque (2009) and Gaslight Arcanum (2011). 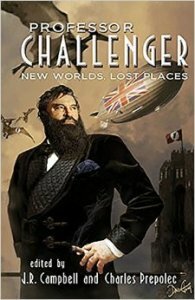 Both books are edits by Charles Prepolec and J. R. Campbell, the same team behind the forthcoming anthology Challenger: New Worlds, Lost Places, in which Volk and I will again share the pages. I had the opportunity to meet Volk when the World Horror Convention was held in Brighton in 2010, right around the time his story “Swell Head” was released in The Seventh Black Book of Horror. The book launched at the convention, and “Swell Head” made a strong impression on me, lingering in the way the best stories do, acquiring richness and meaning over time. While in Brighton, I gave Volk a copy of the my newly released CD Veins: The Soundtrack, which included some spoken-word tracks that have since been released as Aberrations. He evidently liked what he heard, because later that year he asked if I’d be interested in doing an audio performance of “Swell Head.” I didn’t have to think twice about that one. In one respect, “Swell Head” is an atypical Stephen Volk story. Its narrator has a distinctly American voice, making the story a fitting project for the 21st-Century Scop. In other respects, it’s very much what one might expect from the author that Andy Hedgecock (Asst Fiction Editor of Interzone Magazine) has called “one of the most provocative and unsettling of contemporary writers.” The story is by turns surreal, nightmarish, and yet surprisingly touching in its portrayal of the protagonist’s commitment to his monstrous sibling. Until recently, the 40 minute recording has only been available at StephenVolk.net, broken into two pieces for easy download. Now, for the first time (with the author’s permission), I’m making the recording available as a single MP3 file via my podcast service at Libsyn. To listen, simply click the player below . . . and get ready to enter the strange world of one of our foremost practitioners of fantastic fiction. Scop on! The 2011 Bram Stoker Award™ Winners! The Horror Writers Association announced the winners of the 2011 Bram Stoker Awards™ at its annual awards banquet last night. This year’s presentation was held in Salt Lake City, Utah, at the World Horror Convention, and marks the 25th Anniversary of the awards. The award is named for Bram Stoker, best known as the author of Dracula. The trophy, which resembles a miniature haunted house, was designed by author Harlan Ellison and sculptor Steven Kirk. Derrick Hussey of Hippocampus Press and Roy Robbins of Bad Moon Books. Samhain Publishing served as the Platinum Sponsor for the event. Powered by WordPress and delivered in 1.391 seconds using 39 queries.